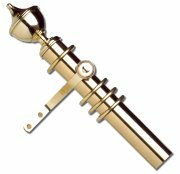 Polished and lacquered 51mm diameter solid brass curtain pole complete with solid brass finials, rings and brackets. Supplied with 10 rings per metre pole. Poles of 2.4m and above have a centre bracket included. Bracket projection 37mm. Poles can also be supplied made to measure, please use the contact form for prices.